Learn what check means in chess. If an enemy piece could capture your King on its next move, we say that your King is in check. The enemy piece is called the checking piece. In the example below, the White Bishop could capture the Black King on its next move. The attack to a King is a serious business. When a player is attacking the King, the player who’s performing the attack must speak the word “check” to bring the opponent’s attention to what’s taking place with his King. When your King in check, you have to save it right away. The King cannot remain under attack. This is really important. How can you save your King from check? 1) move out of the way (though he cannot castle!). In the chessboard above, King could move to d8 or b8. 2) block the check with another piece. In the chessboard above, the White Bishop could move to d7. 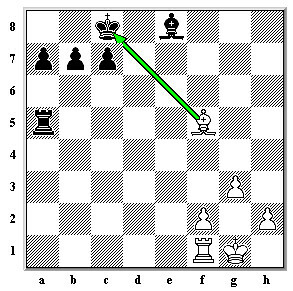 3) capture the piece threatening the king (the checking piece). In the chessboard above, the Black Rook could capture the White Bishop. If you cannot save your King form check, it is checkmate and the game is over. You have lost the game.